In a previous post we built a MySQL database and a data access layer via a repository pattern implemented using Fluent LINQT to NHibernate. We also wired up this repository in our ASP.NET MVC application using Ninject. This post will build out the ASP.NET MVC application a bit to present the information. To help visualize the data we will be using the Google Maps v.3 jQuery plugin that we previously built. Here is a screen shot of the view we are going to build. There is a header and footer on the page. The header contains application title and subtitle designed to look like a road. The footer contains information about the technology with links to the information. The core of the application is a master / slave list and map view. Here is the markup that creates this view. 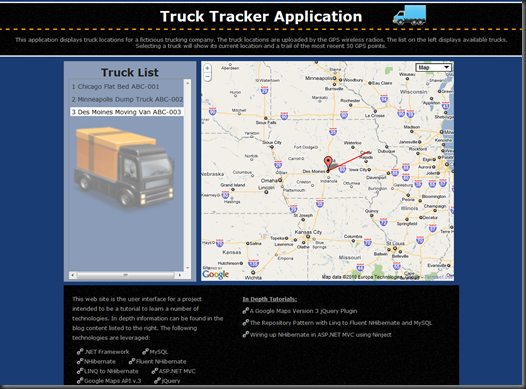 The ‘getLocation’ function fetches detailed information about the truck. This information is used to reset the map center and zoom level. The detailed information includes the latest GPS lat / long point of the truck which is then geo-coded using Google’s map API to get an address. This information is then used to add a marker to the map via a function on the jQuery map plugin. This marker includes a popup that is dynamically created in the ‘createInfo’ function. The ‘getLocation’ function uses the ‘Position’ action method (discussed below) on the ‘Home’ controller. As previously discussed, we are using Ninject as a Inversion of Control (IoC) container. In order to handle object lifetime, Ninject provides a controller factory for our ASP.NET MVC application. This controller factory does not require a default (parameter-less) constructor. The ‘HomeController’ constructor above accepts an ‘IIntKeyedRepository<Truck>’ instance. This repository instance is created by Ninject and provides access to the database. The ‘Index’ action method simple provides an enumerable list of ‘Truck’ objects to the view. The ‘Position’ and ‘History’ action methods each use a mapper object to generate a view-model. The view-model objects are then serialized and returned in JSON format to the browser. It should be noted that the ‘MapToLocations’ method returns a list of ‘JsonLocation’ objects which when serialized to JSON have the exact format required by the jQuery map plugin. Adding a presentation layer to the truck tracker data was relatively easy. Especially since we previously created the database, repository, jQuery mapping plugin, and wired up these objects with our IOC container. I am in the process of deploying this application to the internet. I will post again once that is deployed and will include a download of the solution at that time. What’s next? We now need a way to get GPS location data into the database. I will be creating a web service that provides this feature. Check back as we explore the various web service options (ASMX, MVC, WCF…etc) to get data into our database. How are you performing the commit at the end of the request? Good question. The controller in this example is using Ninject to wire up the various pieces (see links in article). One piece that is being created is an instance of IUnitOfWork. In this particular example, nothing is being committed to the db. However, to add a new truck you would need to have IUnitOfWork injected into the ctor of the controller. Then you can call ‘Commit’ on that instance. This will then commit. sir how you recieve gps data and save into database ? i am new on asp.net and i am developing one solution like for truck, i would like to have this solution joined on mine. Did you find and gps, cant you use celphone? Just ideas, i dont know well. 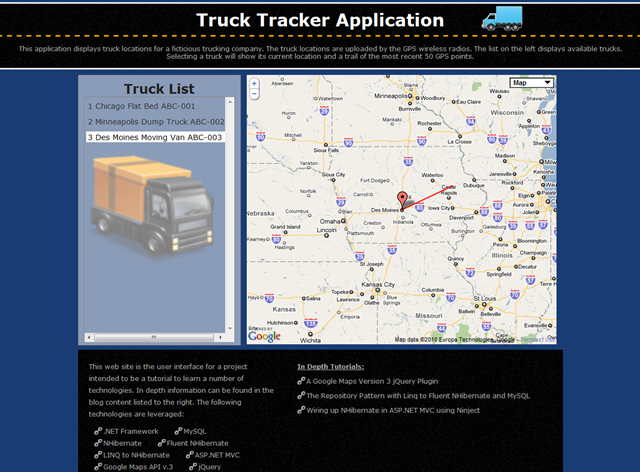 I am working on integrating this into the truck tracker example. thanks for your blog post, it was quite helpful. I do, however, have a problem wiring it up with Ninject when it comes to UnitOfWork. then it does insert the Data-object into the repository, however NOT into the database. i.e. when I do something like Repository.All().Count() it shows that the size of the Repository increased by 1 (which is fine), but there is simply no new entry in my underlying SQLite database. Also, wenn I try to call m.insert(); twice I get an error that there’s no active transaction. Do you have any clue why? Am I doing something wrong? Come to think of it, the problem was binding IUnitOfWork to TransientScope. After binding it to SingletonScope, it worked for at least the first .Commit-transaction. After that I got the same problem saying that there is “no active transaction” when trying to committing again. So after committing, I just begin another transaction. Do you think that’s an acceptable solution or could you think of someting better? This is odd. Not certain what is happening. At first glance, I don’t see anything obvious. Unfortunately, I don’t have free clock cycles to look into this further right now. Sorry. I have a bit too much going on right now. Your solution will probably work most of the time. I think it might have issues if two request come in at nearly the same time. Seems like both request will operate under the same unit of work. This is probably not what you want. This repository solution has evolved into a bit more robust code base. I haven’t gotten a chance to blog about it yet, but you can find the code here: https://github.com/rcravens/GenericRepository. This is what I use for a number of projects (work and home). I have a database for this kind of application working fine from last 4 months my home made gps tracker..please let me know if someone need that. I ma inserting location into database with a webservice. Hi Ashwani, can you please send me the database script?? Hi Bob, your project is very useful..as i am also working on vehicle tracking .But how did you store the lat /lang values ….did you use sql server 2005 to already store the available (known)lat/lng values or have you used gps modem to store dynamic data in to the database and then retrieve the data from there. I did not use any built in database types to store the lat / lng values. That is probably the way to go. I wasn’t sure about portability between various db types (sql server, mysql…etc). I think http://gpsnerd.com/ is not working. Its down. Fail to load Assembly file “Antlr3.Runtime” . Can you look into please ? Thanks for the heads up. The site is back up now. Just curious, has Google opened up their license to be able to use these internally without paying thousands? or does it still have to be on an external web site? hai boi, when i’m trying to see the tracker code at http://gpsnerd.codeplex.com it not there anymore. Can u send me the code? i’m new in mvc and GIS, wanna explore it. By the way, can we change the map rather than using google maps with other? It is still there. You need to go to this link (http://gpsnerd.codeplex.com/SourceControl/list/changesets) and click the ‘download’ button. I am looking out for similar kind of implementation for my project. Thanks for sharing your wonderful work. Appreciate it. I have a doubt in dataservice implementation. Actions in the controllers are directly calling dataservice methods. I wanted to implement interfaces for them too like IHomeDataService and call them via. interfaces. If there is any change in data retrieval mechanism, I can plugin them easily without changing any of the MVC application code. Do you think this it’s better approach. If yes, where do IHomeDataService is best to implement, is it in Infra library? For larger applications, I recommend adding the complexity to abstract the services into interfaces and inject them into the controllers. This allows everything to be tested a lot easier. For this example, I chose not to add that extra complexity. I’m doing website project in Asp.Net on Gps Based Asset tracking System. latitude, speed & location on every 2 seconds and directly stored in DB table. I just want to display tracking position on google map on every 2 seconds…. I hope can any one help me on this…. hi sachin how you save gps data into database. I a friend of mine has a food truck and he wants a map on his own web site, so that people could be able to track him. would you please tell me what device I have to buy in order to integrate it with this application ? Do you have the database scripts posted somewhere? brother can you tell me about the link from where i can download this application?